Tired to forget your tents and siege without nothing more than your bow ? 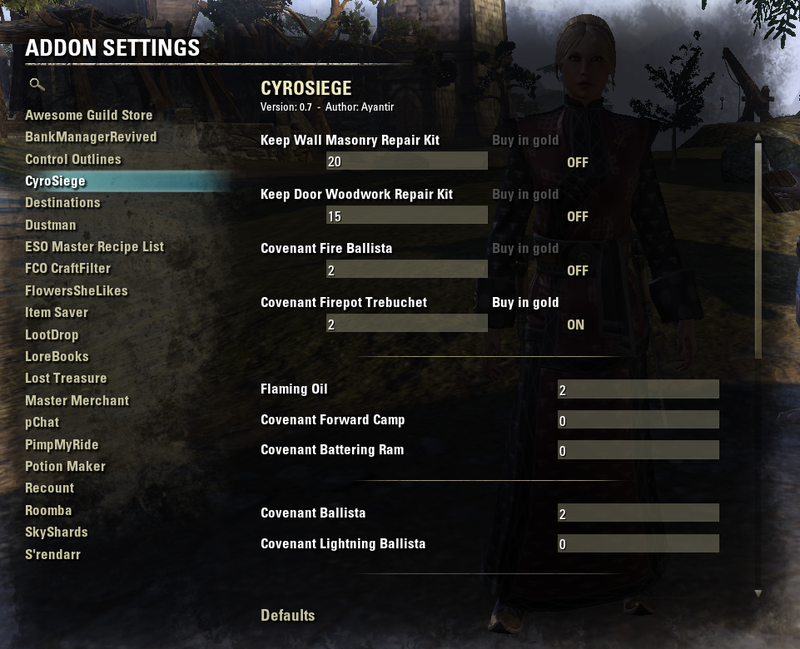 CyroSiege keep your bagpack full of Siege Materials ! The addon monitors the all siege items. - Added features at bank, disabled per default. 1) Withdraw all sieges weapons/ava repair items/soul gems/pvp potions in your bank. 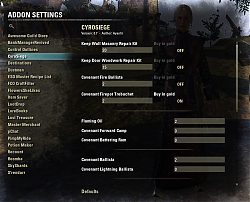 2) Withdraw only items missing defined in CyroSiege (if you need 1 fire treb, it will pull 1 fire treb from your bank). 2) Deposit all the surplus and keep only the threeshold defined in CyroSiege. For both situations, you can also do nothing, and those features can also be keybinded if you prefer a manual move. Hi everzbody, I'm little new at lua and making AddOns. I've realized that CyroSiege does sometimes buy items as I've allready enough of it in my inventory. I wanna try to fix this but I don't know where to search, so my question is if someone can give me a little tip how to fix it? the German translation lua file (CyroSiege\i18n\de.lua) was set up incorrectly, I fixed it. I'm going to complete the translation when I have some spare time. Thanks a lot for your addon, hope this helps. Thank you, a friend reported me few errors with de translations, I'll see too quickly update. With little instructions of you perhaps I can help you to fix lang=de problems for now and later ?? It has been added, with options and keybind. Not very tested, please report bugs if I forget some.. This looks awesome! Can't wait to try it out. Would it be possible to also add a command/hotkey that would deposit all of your siege gear in the bank then another that would withdraw it all? Maybe using the same counts for the withdraw? Just having a quick way to deposit and withdraw siege gear when switching back and forth from"PVE mode" would be fantastic! I didn't added soul gems to the gold list, because they're a bit too expensive and think no one should use this option (consider buying them in AP or in gold at guild store). I wish to only use GOLD to purchase items that have a GOLD or AP buy option. How do I do this? Request: Option to use gold instead of AP. With the Akaviri motifs, etc it would be nice to be able to choose if you want to spend gold or AP for items. Thank you. The add-on thought it bought more than it actually did, "AP after" is negative. Love this addon! Saves me sooo much time. However, Keep Wall Masonry Repair Kit seems to be bugged. Can't purchase 50 or less of this item. Could be more slightly, but I know 150 and 200 amounts work. Sorry, I don't have more to go on, let me know if I can be of further help. Just did the test with 10 then 50, then 300 and no problem. Could you check there is no space before or after the value you set?